We all know or should by now that if you buy an inferior product problems may arise. 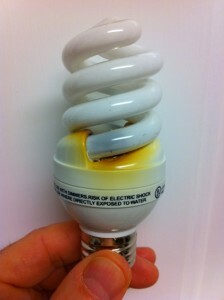 CFL bulbs are to be considered dangerous because of many problems that come with them . The burning out of these bulbs have different outcomes. Sometimes it just burns the plastic but I have heard of other times when the bulb actually start to throw a flame straight out the connection between the glass and the plastic. Other problems with these bulbs is the dirty electricity it creates in the home and the clean up process is crazy .In my view CFL`s should be banned for safety reasons . CFL`s can easily be replaced with LED`s which are safe. The government should stop giving rebates or incentives for us to purchase the CFL`s and start giving incentives or rebates on LED`s instead – that is if they care enough about people to do the right thing. You are right on. Your experience mirrors mine.